Handmade paper with pigmented paper pulp, 38 1/2 x 27 inches. Handmade paper with pigmented paper pulp, 36 x 24 3/4 inches. Handmade paper with pigmented paper pulp, 41 1/2 x 26 1/2 inches. Handmade paper with pigmented paper pulp, 37 1/2 x 26 1/4 inches. Handmade paper with pigmented paper pulp, 33 1/4 x 25 inches. Handmade paper with pigmented paper pulp, 36 x 25 1/2 inches. Handmade paper with pigmented paper pulp, 34 1/4 x 23 inches. 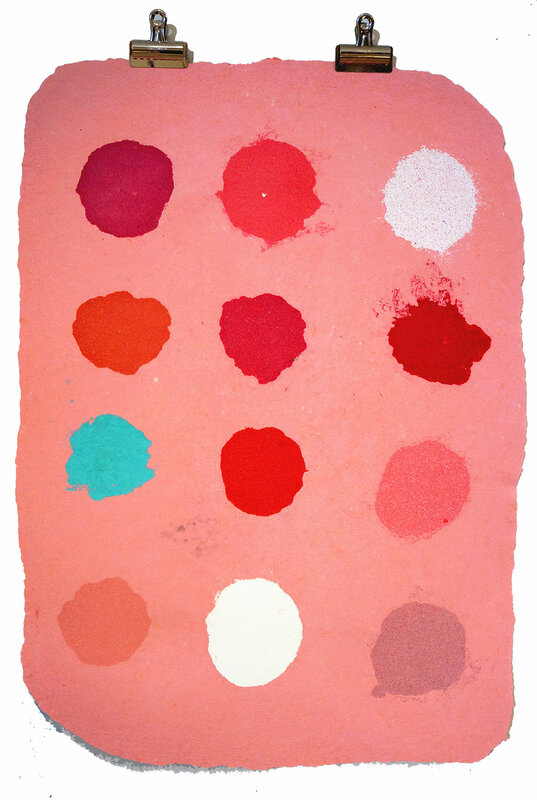 Handmade paper with pigmented paper pulp, 18 1/2 x 24 1/2 inches. 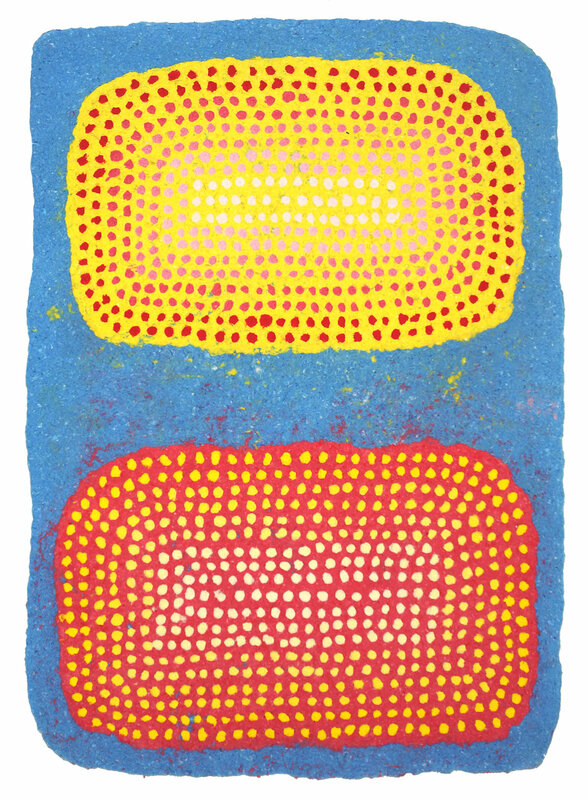 Colored pencil, marker, ink and acrylic on handmade paper with pigmented paper pulp, 20 1/4 x 13 1/4 inches. Handmade paper with pigmented paper pulp, 23x18 inches. 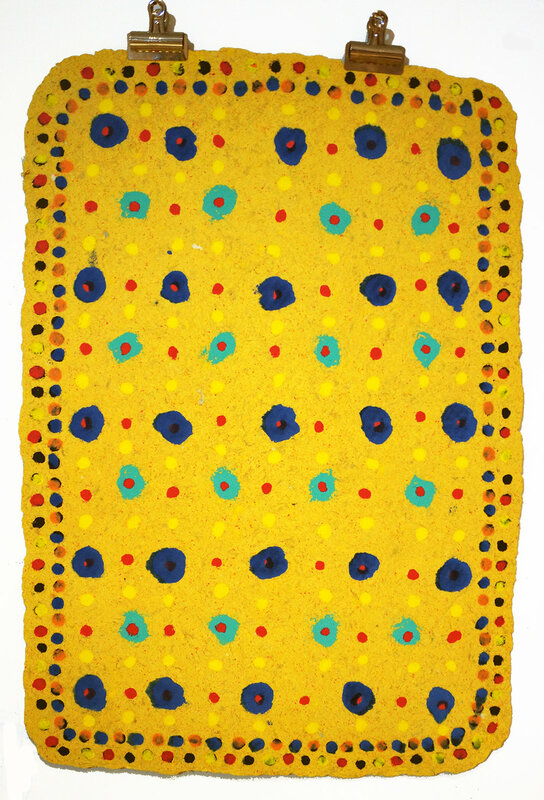 Acrylic and colored pencil on handmade paper with pigmented paper pulp, 21 3/4 x 14 1/4 inches. Handmade paper with pigmented paper pulp, 17 1/2 x 13 3/4 inches. Natural indigo dyed handmade paper with pigmented paper pulp, 18 x 14 1/2 inches. Natural indigo dye on handmade paper with pigmented paper pulp, 21x16 inches. Handmade paper with pigmented paper pulp, 25 3/4 x 18 1/4 inches. Handmade paper with pigmented paper pulp, 21 1/2 x 26 1/2 inches. Colored pencil, pen, ink, acrylic and marker on handmade paper with pigmented cotton and abaca pulp. 14 1/2 x 20 inches. Graphite, colored pencil, pen, marker, ink, acrylic and dried tulips on handmade paper made with abaca pulp, 26x19 1/2 inches. Dried tulip petals embedded into handmade paper made with cotton and abaca pulp, 17x25 inches. Handmade paper with pigmented paper pulp, 11 1/2 x 27 1/2 inches. Graphite, colored pencil, pen, marker, ink and acrylic on handmade korean paper, 22x31 inches. Graphite, colored pencil, marker, ink, and acrylic on handmade Korean paper, 22x31 inches. Colored pencil, pen, ink, marker and acrylic on paper, 30x23 inches. Graphite, colored pencil, pen, watercolor and plasti dip on paper, 7x10 inches. Graphite, colored pencil, pen, and watercolor on paper, 10x7 inches. Acrylic, pen and colored pencil on paper, 10x7 inches. 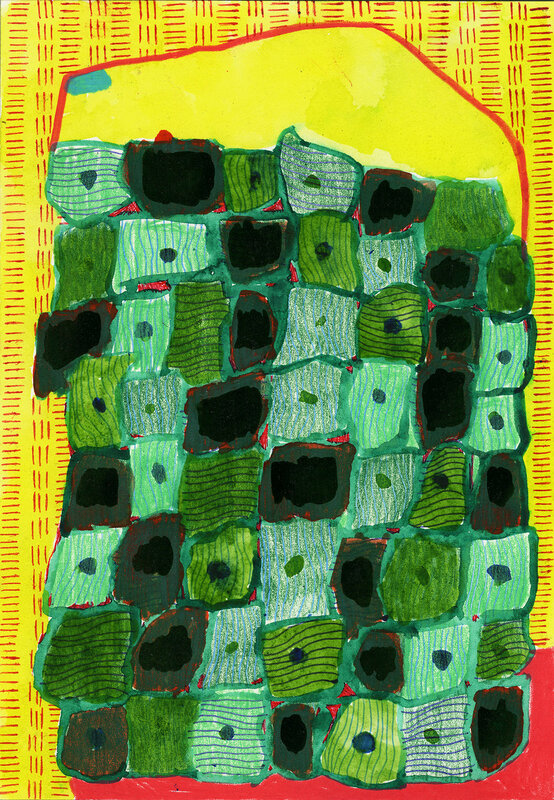 Colored pencil, pen, and acrylic on paper, 10x7 inches. Watercolor, colored pencil, pen and acrylic on paper, 10x7 inches. Colored pencil, acrylic, ink, and pen on handmade paper with pigmented paper pulp, 11 1/2 x 13 inches. Acrylic, colored pencil, pencil, pen and collage on paper, 7x10 inches. Ink, colored pencil, pen and acrylic on handmade paper with pigmented cotton and abaca pulp, 11x13 inches. Watercolor, ink, colored pencil, pen and acrylic on paper, 10x7 inches. 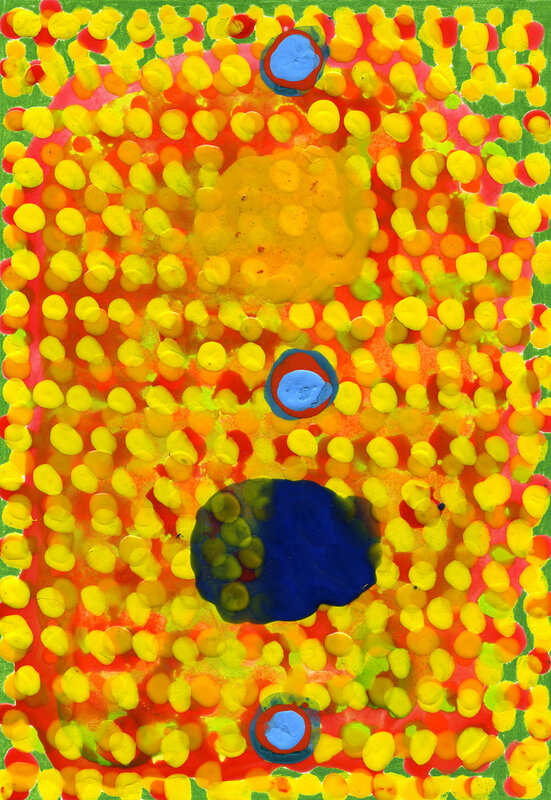 Acrylic, enamel and colored pencil on paper, 10x7 inches. Acrylic, Ink, and colored pencil on handmade korean paper, 37 x 25 inches. Acrylic, ink, and colored pencil on handmade korean paper, 22x31 inches. Acrylic and colored pencil on handmade paper with pigmented flax pulp, 11 x 8 1/2 inches. Graphite, pen, ink, colored pencil, and acrylic on paper, 22x30 inches. Acrylic, ink, pen, and graphite on handmade paper, 8.5 x 11 inches. Acrylic, ink, pen and graphite on handmade paper, 8.5 x 11 inches. Acrylic, pen, and graphite on handmade paper, 8 1/2 x 11 inches. Acrylic, pen, graphite and colored pencil on paper, 22x30 inches. Acrylic, ink, pen, colored pencil, and collage on paper, 7x10 inches. Acrylic, ink, pen, colored pencil, and collage on handmade paper, 8 1/2 x 11 inches. Acrylic, ink, pen, and colored pencil on handmade Korean paper, 25 1/2x 37 inches. Acrylic, ink, and colored pencil on handmade paper with pigmented flax pulp, 8 1/2 x 11 inches.